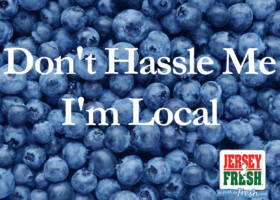 The last New Jersey Blueberry was picked over four months ago but that doesn’t mean life on the farms has slowed down. 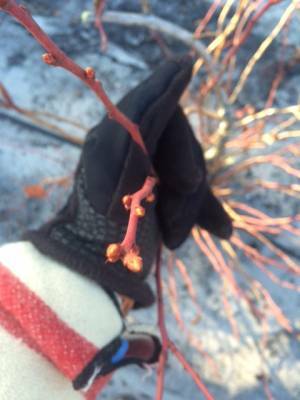 Blueberry bushes need hands-on attention before the winter chill hours to ensure a strong crop the following year. 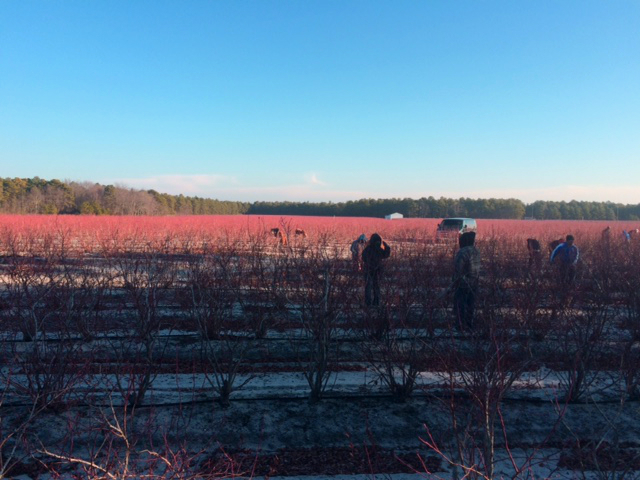 I spent the day learning the enormous task of getting blueberry bushes ready for winter at one of our cooperatives’ farms, Whalen Farms, out of Shamong, NJ. 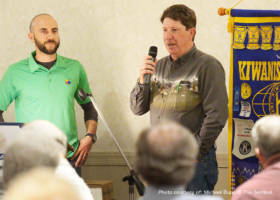 Jeff Whalen, owner of Whalen Farms, was occupied chasing deer through the woods of New Jersey so I was placed in the hands of his farm manager, Chuck Torres. Chuck has been around blueberries his entire life. Growing up in the area, he was working in the fields of local farms since he was old enough to have a job. Chuck tells me he was born to farm and couldn’t imagine doing anything else. He has gained a vast amount of knowledge throughout his years, working his way up the ladder from a field worker to farm manager. No better person to learn from than someone who has performed every task there is on a blueberry farm. Our day started bright and early at 8am (the real workers were out in the fields by 7am) when I met Chuck in the farm’s office. I found him visibly frustrated sitting in front of a computer, poking away at his keyboard. He later admitted he would rather be in the field with his hands dirty than mess around with computers. We soon set off to the field location which was a twenty minute drive to Tabernacle, NJ. Farming in New Jersey is different than in other parts of the country; due to the population density of the state and federally protected land, which causes farmers to acquire land wherever they can. Jeff Whalen is always looking to expand and improve his farm, purchasing or leasing property while constantly looking for ways to sustainably grow the best tasting blueberries and cranberries our state has to offer. As an example of Jeff’s dedication to sustainable farming, he planted pollinator habitat that acts as a safe-zone for the thousands of bees released into a blueberry field to perform the critical task of pollinating the crop. Does that sound interesting? I will be writing an in-depth article surrounding beekeeping and its critical role in agriculture, in the near future. Stay connected with us on Facebook or Twitter for updates. Driving through the Pinelands of Southern New Jersey is almost hypnotic; the dense pine trees create a familiar scenery for what seems like miles. A sudden break in the tree line revealed a breathtaking sea of bare red bushes which stood in stark contrast to the deep green of the surrounding pines. This specific piece of land I would be spending the day at contained 40 acres of blueberry bushes. To ensure the plump and juicy blueberries the Jersey Fruit Cooperative and Farmhouse Fruit is known for, each blueberry bush must receive special treatment from an experienced field worker who thins the bush of damaged or old canes. It is a meticulous task that must be done by hand since there is no machine in the industry that can replicate what a knowledgeable worker can do with a pruner. 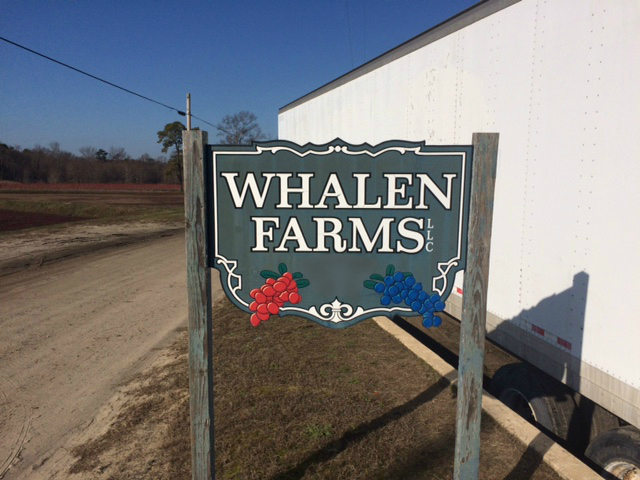 Whalen Farms is made up of 160+ acres of blueberry bushes. Roughly 660 plants fit in one acre of land, that works out to be somewhere in the ballpark of 105,600 blueberry bushes needing to be thinned out every season. To give you an idea of how much work is involved in the thinning process; if I set out to trim each bush by myself and spent 30 seconds on each plant, working non-stop 24 hours a day, I would complete my task in 36 days. Chuck estimated the crew of 40 would trim all the bushes on the farm in a month, if the weather cooperates. I was lucky enough to have joined the crew on a very important day. This day marked the final field of blueberry plants to trim for the season. After some quick training from Chuck, I was given the ceremonial task of trimming the final row of blueberry plants on the farm and the workers were more than happy to finish up earlier than expected. 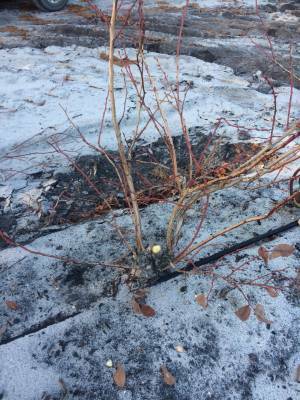 The blueberry bushes this time of year are already showing signs of budding which makes it is easy to pick out the canes that are not producing the strongest buds. Canes that are 3-4 years old produce the best tasting and largest blueberries while anything over 7 years old is cut away, leaving more room for the younger canes to flourish. As you can see in the picture above, the healthy red cane shows large buds which will grow into delicious blueberries over the next 6 months. Chuck noticed I was hesitant to cut my first few plants, not wanting to inadvertently cut away a strong cane. He reassured me with an old saying from his days trimming bushes, that “it’s better to accidentally remove a healthy cane than leave a dying one.” With that thought in the back of my mind I continued trimming and found the task to be rather entertaining and fun. Most of the clippings are left in between the rows of blueberries. 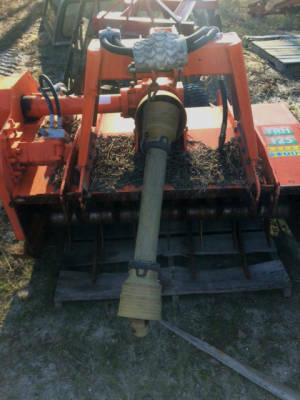 Soon to follow will be a specialized machine (seen below) pulled behind a tractor to pulverize and spread the clippings which will add organic matter to the soil as it decomposes. Not all plant trimmings will be left as nutrients for the soil. Jeff Whalen takes this time to save 4 inch cut sections so they can be planted directly into grow beds, right along side the packing house. These clippings will get special attention for the next 3-4 years until they are old enough to be planted back into the fields where they will start producing the delicious blueberries our Farmhouse Fruit customers love. The picture below shows a 2 year old bed of blueberry clones. These youngsters still have another 1-2 years before they can be planted in place of older bushes. 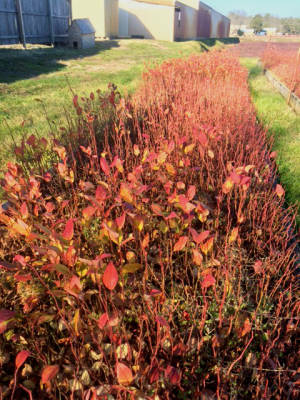 This isn’t a common practice among blueberry growers, many farmers choose to purchase immature blueberry plants from reputable nurseries in New Jersey which are ready to be planted in the field. I will leave you with the picture below of the final blueberry plant that was trimmed on Whalen Farms, by yours truly. This picture represents the finishing touches on the fields before they spend the cold winter months growing into the delicious blueberries that will be shipped to our dedicated customers, nationwide. These blueberries might even be used in our Fundraising Program which has helped non-profits in our area ethically raise the money they need to reach their goals. 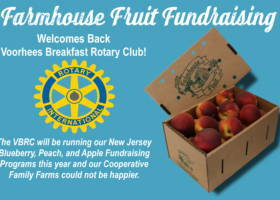 I hope you enjoyed your time here and will come back to see what Farmhouse Fruit and the growers of the Jersey Fruit Cooperative have in order for the 2016 season.